Perhaps you have children running through your house 24/7 or found an amazing deal on a used sofa that just needs a little TLC. Whatever the reason, you can't help but notice an odour emanating from your furniture that just couldn't be prevented. Put the Febreeze down! As you will see, there is no need to bring heavy duty chemicals into this. I recently had a friend (who worked, ate, and slept in boxers) live on my microfiber couch for nearly a year. Over the summer. Needless to say, the couch was near ruined with stains and stank and when he moved out I was ready to pitch it entirely until I decided to experiment. Worst case scenario, I ruin the couch and trash it anyway. Best case scenario, I revive it. It was a no-lose situation. Being familiar with the magical properties of baking soda, I decided to research the science behind it in order to fully understand how to attack the sofa stank. Baking soda (sodium bicarbonate) is effective against odours because it is a base. This means that it neutralizes the PH of stinky acids rendering them odourless. It was a good place to start. I rubbed baking soda over both my mildly musty mattress and my stinky sofa. I waited 30 minutes to let the magic happen, and then used a canister vacuum with an upholstery attachment to remove it. After the 5-10 minute mark, I noticed the mustiness had left the furniture and had evaporated into the air. I opened the windows to get a cross-breeze going and air out the odours. I suggest using a canister vacuum, or emptying out your vacuum bag after doing this, as the baking soda easily filled half the canister and I would imagine the powder may damage your filter with prolonged contact. After this treatment, the mattress was cured of all mustiness and was good as new - no chemicals necessary. The sofa had improved its stank somewhat, but it clearly had a larger problem than baking soda alone could fix. 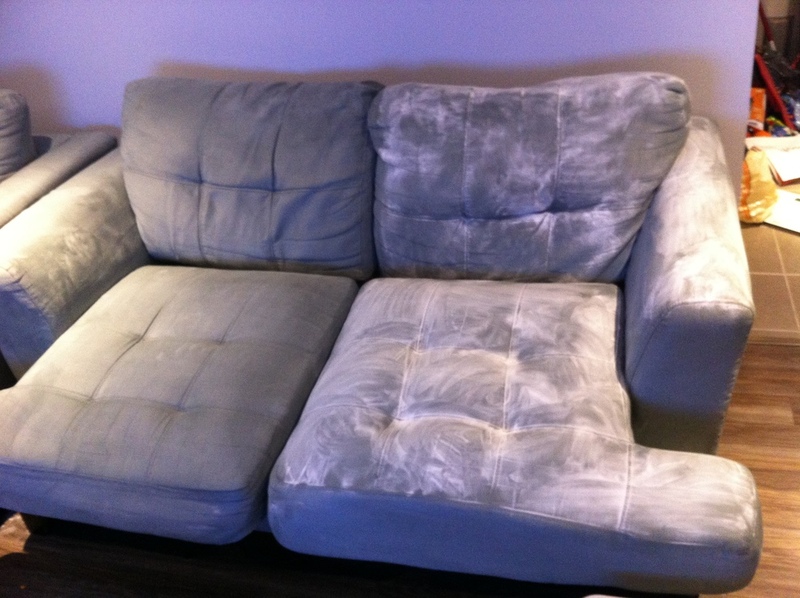 I realized that the sofa needed a proper sterilization and washing in order to remove the dirt, bacteria and oil that had seeped in over an extended period of time... Gross. My favourite natural household sterilizer is good old fashioned vinegar (acetic acid). Just spray it on, let it set for 30 minutes to kill most germs and bacteria. Next step: remove the dirt and oil from the fabric. The best natural degreaser and dirt buster that I know of is natural dishwashing detergent. I filled a bowl of soapy water and dipped a microfiber cloth in to get it soaking wet. I then wiped down the entire surface using a circular pattern to lift the dirt caught in the microfibers. The cloth was pretty dirty by the end of wiping, which told me I was on the right track. I then did another pass with a new cloth and just water. After it dried I noticed the fibres were stiff and the texture was rougher than before. I used a soft bristled brush (like the dusting vacuum attachment) to gently return the microfiber to its softer state. Success! The stank is gone and the texture of the sofa is similar to before. I'm so happy to be able to reclaim my beloved sofa and can relax easy knowing that it is properly clean. A word of caution: It should be noted that before you attempt to wash your microfiber sofa, you should conduct a test section on the back of it, as some microfiber will stain when touched with water or any fluids. Also, think of washing your sofa like washing a soft sweater. You know that throwing it in the wash will make it lose its softness over time, but you're just too lazy to dry clean it, so into the wash it goes and hope for the best. My sofa was in a desperate state, so it was worth losing a bit of the softness in exchange for the cleanliness, but you should always keep in mind that the more you wash it and brush it, the more the fabric will wear. Going forward, I plan to do the baking soda treatment every season as a preventative measure and hope that I can avoid pulling out the big guns in the future. Good luck and leave comments to let me know how it worked for you. Older PostDo You Clean Before Your Maid Arrives?